Whilst the hosepipe ban is a justifiable excuse for not washing your car with water, it doesn’t mean you can’t get it sparkling. Waterless car cleaner is now available in an assortment of types to cover all angles of your car. Carnauba Gloss is a waterless form of car wash containing a range of smart cleaners and natural carnauba wax to not only shine but protect your vehicle. Waterless Car Cleaner comes in a 500ml spray bottle. Simply squirt the liquid over the dirty area, rub and wipe off with one cloth and then buff to shine with a secondary dry cloth. Go Waterless offer an extensive range of waterless car cleaners to tackle even the trickiest areas. Products include waterless car cleaners for you tyres, detailing and carpet. 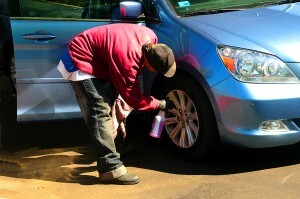 They even do a special formula to rid your car of bugs, bird droppings and tree sap. Sold in 500ml bottles, refills are available in 2.5l bottles. By storing these at home and only refilling when necessary you can reduce the weight of the products you carry around in your car whilst saving both money and the effect on the environment. Washing your car with water uses an estimated 100litres of water. What a waste! Waterless car cleaner is now available as a green alternative to traditional methods and delivers an equally impressive result. To find out more contact Go Waterless Today! Be the first to comment on "Hassle Free Waterless Car Cleaner"